Most horse owners enjoy feeding their horses. It's fun to see your horse enjoy its meals and coming running to you when it sees you coming with the feed bucket. But it's easy to make a mistake when planning your horse's dietary needs. Avoid these 10 common feeding mistakes. As horse owners, we usually enjoy looking after our companions and that often means providing them with the best feeds possible. However, it's easy to go overboard on the feed. Overfeeding can lead to problems of obesity including equine metabolic syndrome and can lead to laminitis. If you find yourself becoming a master chef for a horse that doesn't have any unusual or specific feeding requirements, you could be in danger of overfeeding your horse. Most horses need a very simple diet of good pasture or hay and only need supplements or concentrates if there is a shortfall in nutrition. There's no need to be mixing and cooking bran mashes, slicing carrots and serving up elaborate meals. Having hay tested is a good idea, as it indicates what types of supplements you might add to your horse's diet. Overfeeding is a particular problem in young horses. While it's tempting to keep your weanling or yearling pleasingly plump, too rapid growth can cause joint malformations. Your youngster will benefit from slow steady growth, regular parasite control medications and ample exercise that keep it lean and fit. Underfeeding can be a problem with senior horses and horses that are working hard. While hard-working horses can be expected to look lean, they shouldn't look gaunt. If hay or pasture won't keep your working horse in good condition, look to concentrates to make up the shortfall. However, keep in mind that the bulk of your horse's diet should be made up of grass or hay. Underfeeding hay or pasture and overfeeding grains and concentrates can lead to colic. It's easy to look at a pasture from the distance and think it's lush and green. But closer inspection may reveal that your pasture is being overtaken by undesirable weeds. This means horses have to work harder to find enough food and may start eating the less nutritional and sometimes toxic weeds. Look after your pastures so they can provide good grazing for your horses. Buying hay can be difficult, but it really is worth it to be particular because poor hay can cause all types of problems. Hay may be nutritionally deficient. Some hays are not suitable for horses and can cause colic. Dusty, moldy hay can be bad for your horse's lungs. It's important to feed both hay and concentrates by weight not by volume. Although it will be difficult to determine the weight of the hay your horse eats if it is eating free choice from a round bale, you can estimate the weight of the hay your horse is eating if you're using small square bales. Why is this important? 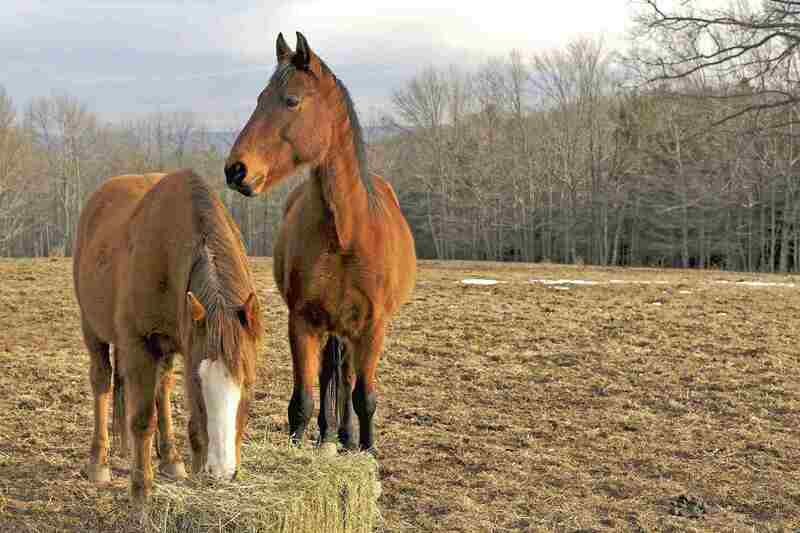 Generally, owners throw their horses a 'few flakes' of hay for each meal. But not all small squares are of equal weight. Weighing grain concentrates is important too. Most caretakers use the scoop method. But horse feed companies recommend feeding by weight and calculate recommended portions by body weight. If you just go by eye, you may be under or over-feeding your horse. At least weigh the portions to calculate the amount, and then mark your scoop so you're feeding the same amount each time. At best, over-supplementing is throwing your money away. At worst, over-supplementing can cause mineral or vitamin imbalances. Some vitamins and minerals are toxic when consumed in large quantities. Have your hay tested and check the ingredients of your concentrates before adding vitamin or mineral supplements. Some internal parasites compete with your horse for the food they eat. A regular de-worming program can clear out harmful parasites that steal nutrition and can damage your horse's internal organs. While equine dental problems aren't really a feeding problem, your horse will not be able to get all of the nutrition it can if it can't chew properly. This is especially common in older horses who may have missing or loose teeth. Mature horses can develop hooks and sharp edges on their teeth that make chewing painful. Regular dental care is a must. Providing clean plentiful water is essential to your horse's health. Impaction colic can occur if your horse, especially one who has access to only hay, doesn't stay well hydrated. Very cold water can dissuade horses from drinking in the winter — and not surprisingly, that's when impaction colic is most common. A trough heater or half bucket of hot water mixed with the cold is a good way to make sure your horse doesn't have to drink icy cold water. Salt is important to maintain your horse's electrolyte balance. Offering salt-free choice is the best. Some people put loose salt on their horse's feed. Be careful not to 'over-salt'. Most horses can self-regulate with a salt block in their stall or pasture.